Having read the near universal praise heaped upon this summer’s debut album Lush, the impression holds that Snail Mail – the vehicle for 19 year old Baltimore based singer-songwriter Lindsey Jordan – occupies a space somewhere between indie-rock prodigy and even the nascent saviour of the genre itself. The jury is in session but the sold out status of tonight’s show along with a scattering of middle-aged faces in the crowd is testament to the fact that Jordan is – beyond the fact of her emotive teen guitar confessionals resonating with her peers – doing something musically interesting enough to reach a broader audience. 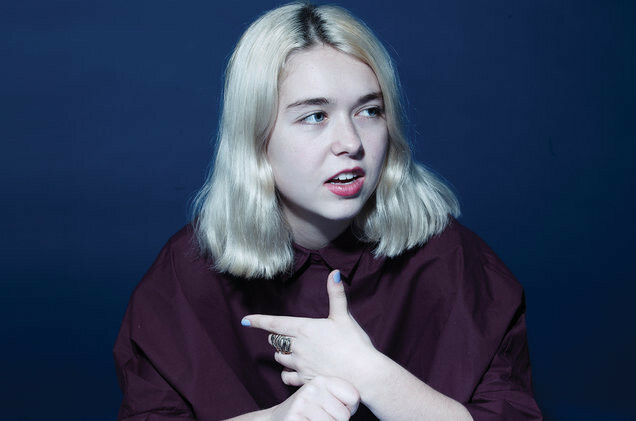 Though Pavement, The Velvet Underground, Liz Phair and Fiona Apple have been stated as influences, Snail Mail sound more like contemporaneous bedfellows with Sophie Allison, who performs similarly direct, chunky chord driven laments of relationship minutiae under the moniker Soccer Mommy. Taking heed of the critical reaction to Lush and the anticipatory exalting of Jordan’s gifts, there’s a prevailing sameness to some of the songs and an occasional lack of melodic élan which makes such acclaim seem a little too keen. However, the band’s guitar sounds and economic but coruscating instrumental breaks are consistently cool; ‘Thinning’ has a sprightly solo riff atop the seductive chug of its rhythm part while ‘Speaking Terms’ crisply breaks out from its fairly tuneless end-of-relationship sentiments with neatly subtle string bends and a lucid attack of chords. Ultimately, this is soul-bearing music with deep emphasis on the emotive impact of the lyricism. Jordan’s ability to articulate the emotional chaos and lovelorn rollercoaster of being a teenager is where the appeal lies. ‘Pristine’ – Jordan’s best song and one with melodic clout – brilliantly makes the yearning, first heartbreak agony of “And I know myself and I’ll never love anyone else” sound almost celebratory. Jordan has stated in interviews that the directness of feeling featured in Lush makes for an honesty and vulnerability of material that inspires her to play – in a way that keeps her from the boredom of repetition – with conviction at each live show. And there’s certainly honesty here; Jordan is full of grimacing vocals and close-eyed earnestness. Unfortunately, some of this is lost with lyrics often hard to discern beneath the music and the occasionally overwrought hoarseness of Jordan’s vocals. Elsewhere there are further moments of promise; the fingerpicked ‘Let’s Find an Out’ is a nice variation in sound while ‘Full Control’ contains a powerful anthemic moment at its chorus. Though admitting that she doesn’t usually speak much on stage, Jordan reveals a mid-show obsession for A Star is Born, stating that everyone is “peeing their pants over it in the US.” Amusingly she returns to the subject a full two songs later, requesting a show of hands from those who’ve seen the film and imploring a display of love for Lady Gaga. The band then performs a humorously impromptu rendition of ‘Shallow’ from the soundtrack. It’s a moment of humour that reveals a healthy wryness lying within the adolescent heart of Jordan’s emotive confessionals. While predictions of Jordan as indie-rock saviour are starkly premature, a clear ability to connect with an audience at such a young age is as valuable a tool as any in getting there. Tagged bristol, Gig review, lindsay jordan, scott hammond, snail mail, Thekla. Bookmark the permalink.